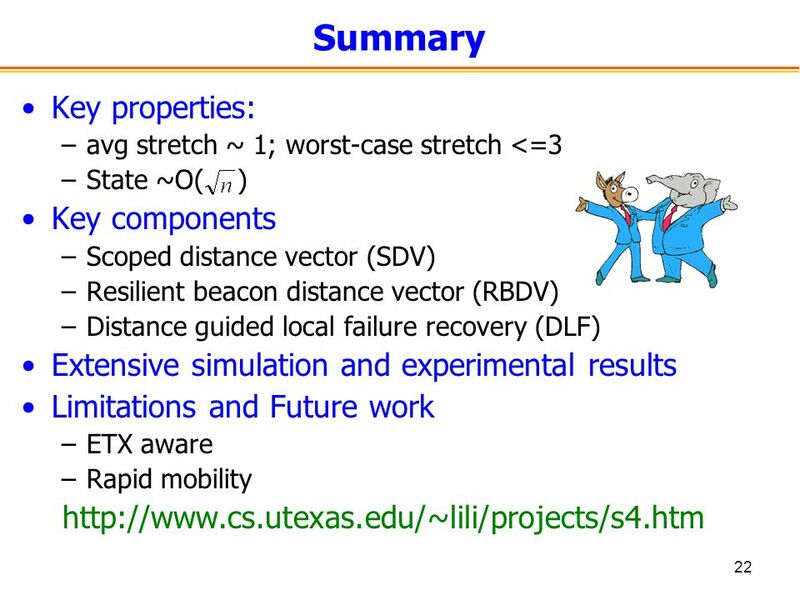 1 S4: Small State and Small Stretch Routing for Large Wireless Sensor Networks Yun Mao 2, Feng Wang 1, Lili Qiu 1, Simon S. Lam 1, Jonathan M. Smith 2. 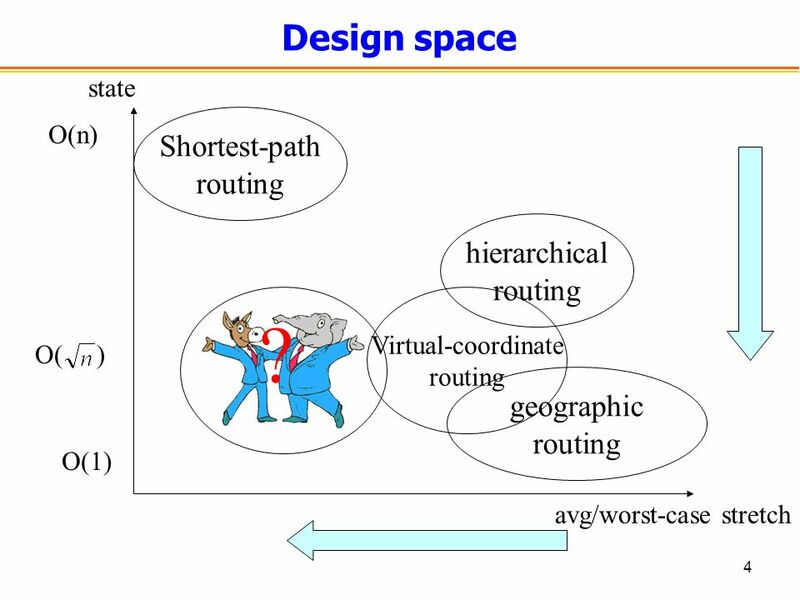 4 4 avg/worst-case stretch state Design space geographic routing Shortest-path routing O(1) O( ) O(n) hierarchical routing Virtual-coordinate routing ? 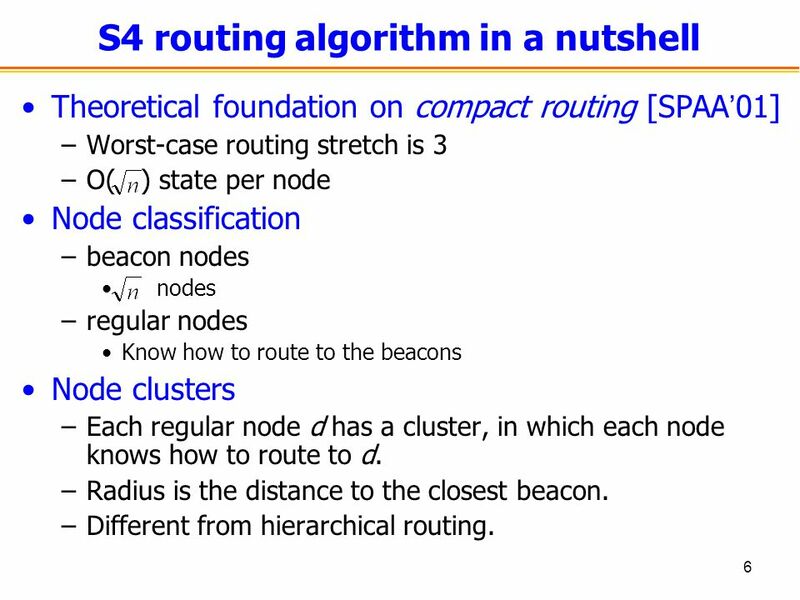 6 6 S4 routing algorithm in a nutshell Theoretical foundation on compact routing [SPAA ’ 01] –Worst-case routing stretch is 3 –O( ) state per node Node classification –beacon nodes nodes –regular nodes Know how to route to the beacons Node clusters –Each regular node d has a cluster, in which each node knows how to route to d. –Radius is the distance to the closest beacon. 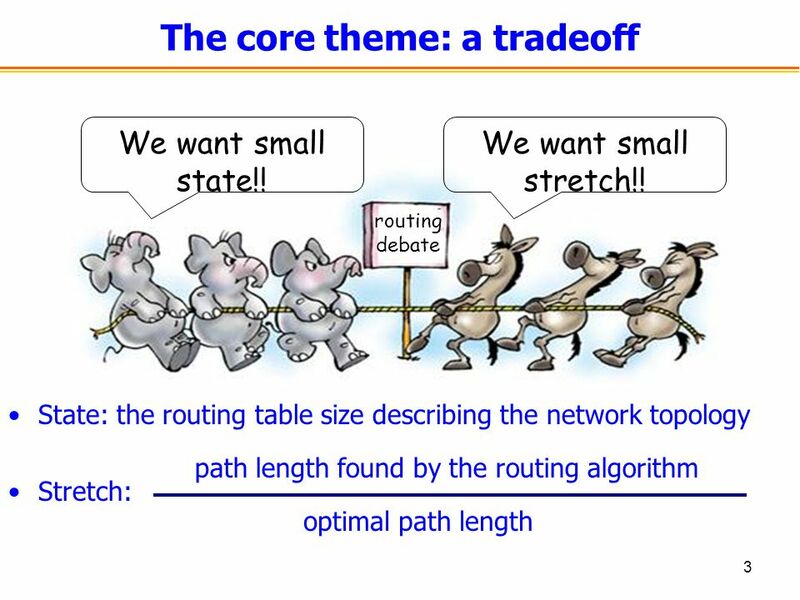 –Different from hierarchical routing. 10 10 Distance-guided local failure recovery 1 2 4 3 6 5 Dest source #1 asks for help from neighbors. 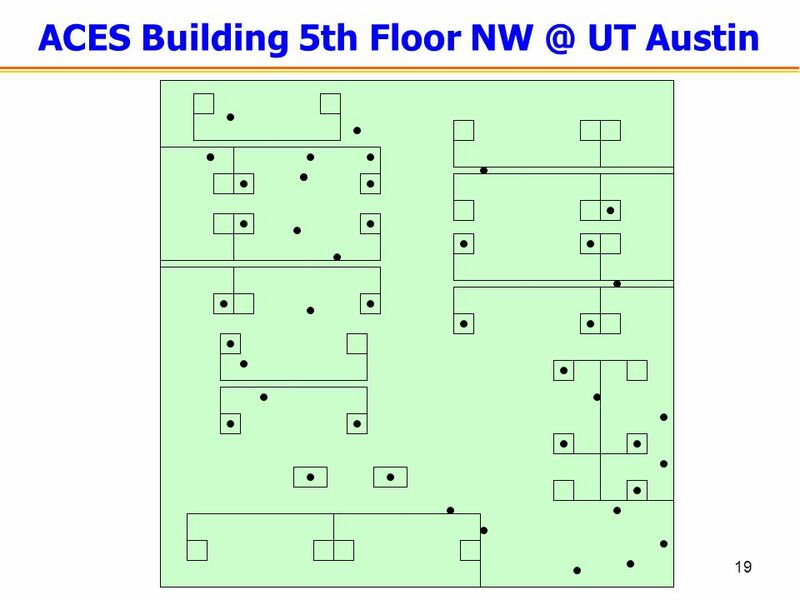 The nodes closer to dest reply earlier. Priorities are estimated from SDV & RBDV. #3 suppresses unnecessary packets. #1 chooses the best neighbor to forward. 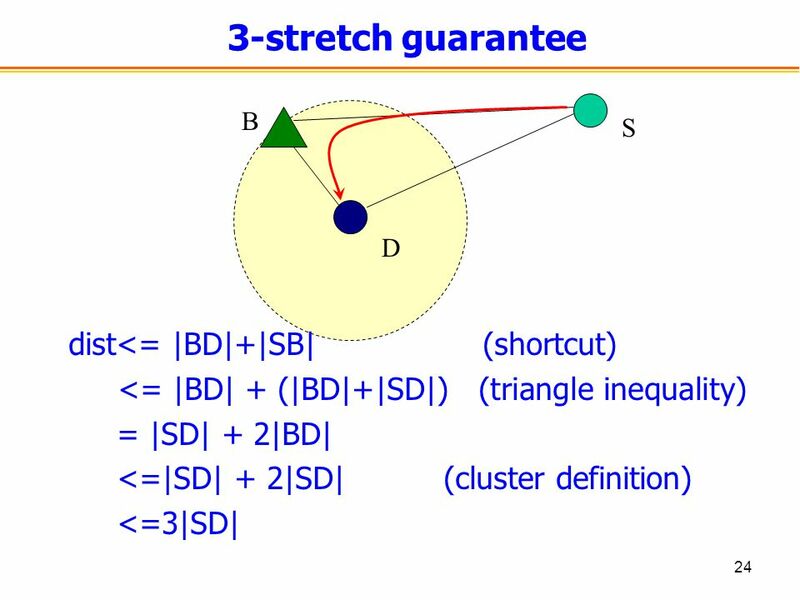 13 13 Questions to answer Does S4 achieve small stretch? 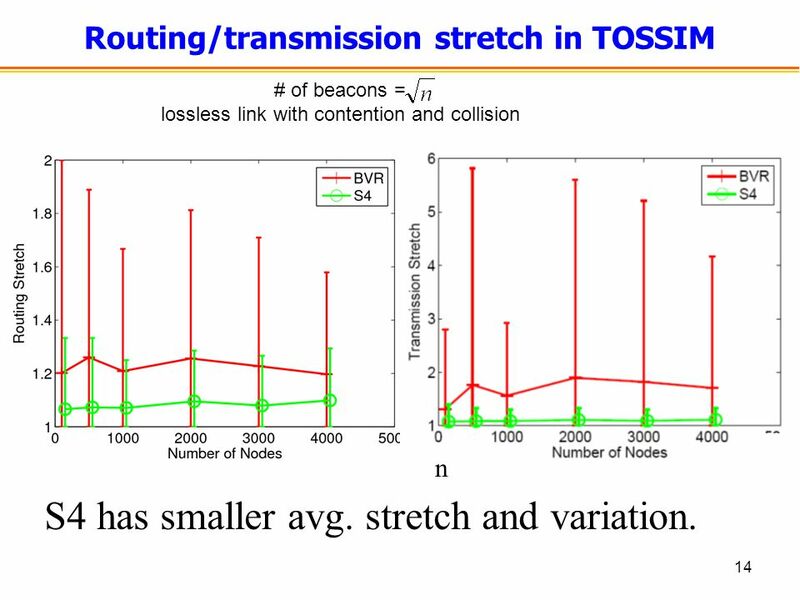 –routing stretch and transmission stretch –Average case vs worst case Does S4 achieve small state? 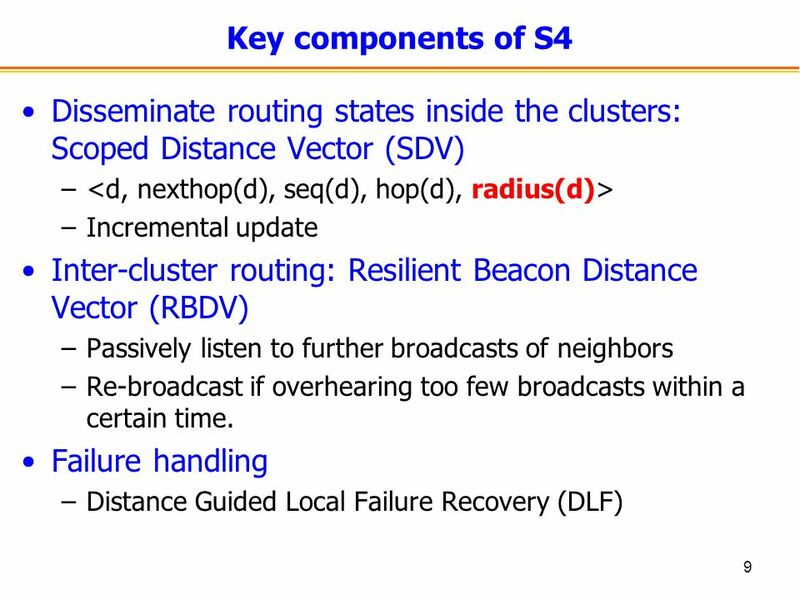 How does S4 perform under failure? 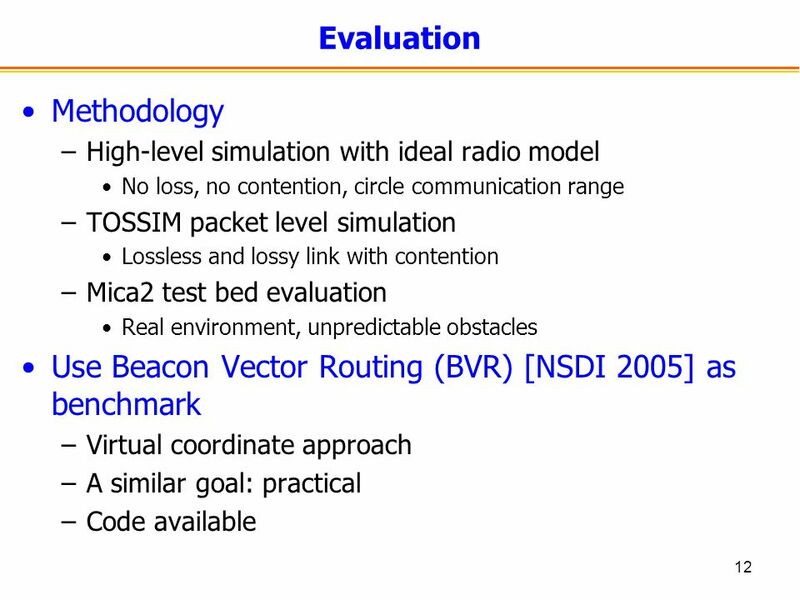 How well does S4 work in a real testbed? 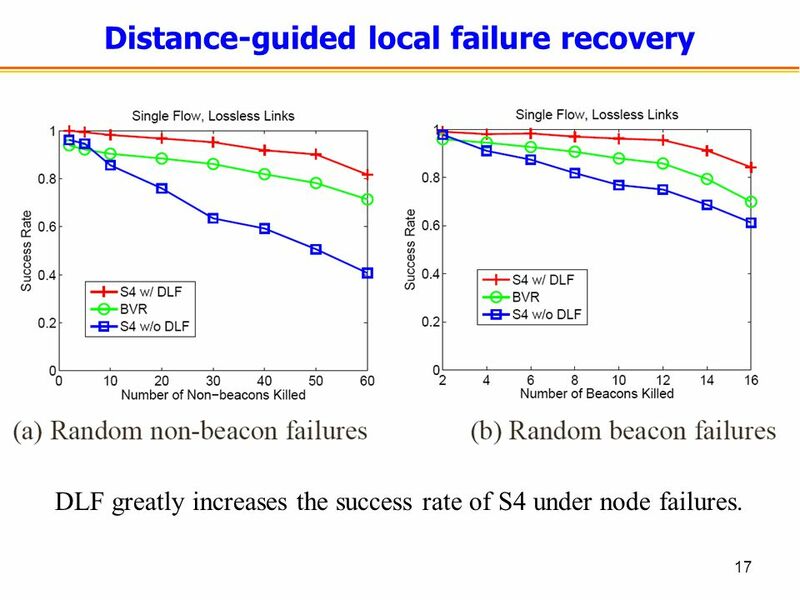 Many others in the paper..
17 17 Distance-guided local failure recovery DLF greatly increases the success rate of S4 under node failures. 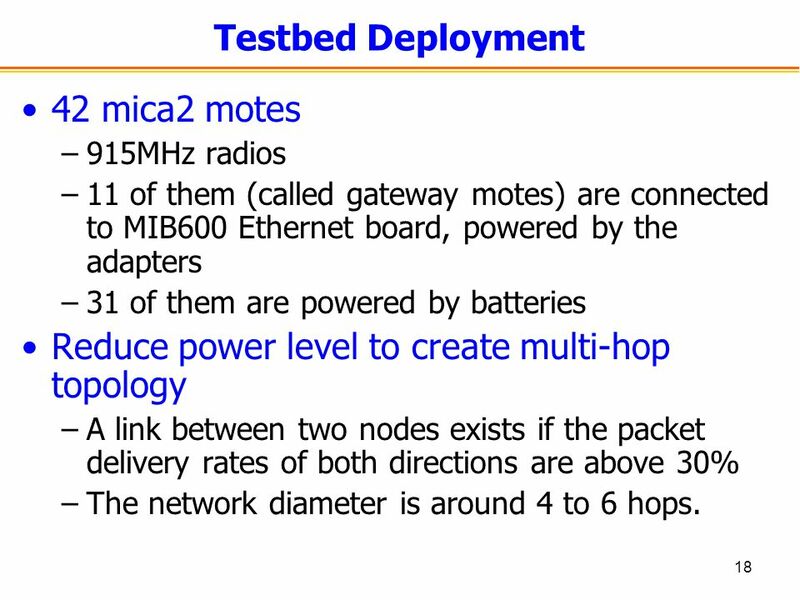 18 18 Testbed Deployment 42 mica2 motes –915MHz radios –11 of them (called gateway motes) are connected to MIB600 Ethernet board, powered by the adapters –31 of them are powered by batteries Reduce power level to create multi-hop topology –A link between two nodes exists if the packet delivery rates of both directions are above 30% –The network diameter is around 4 to 6 hops. 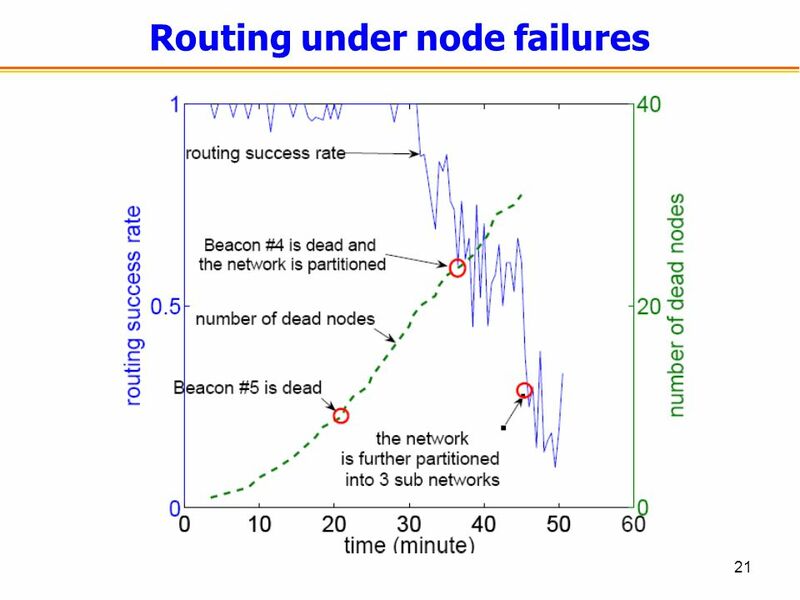 20 20 Routing success rate 6 random beacon nodes Sources are randomly chosen from all nodes. 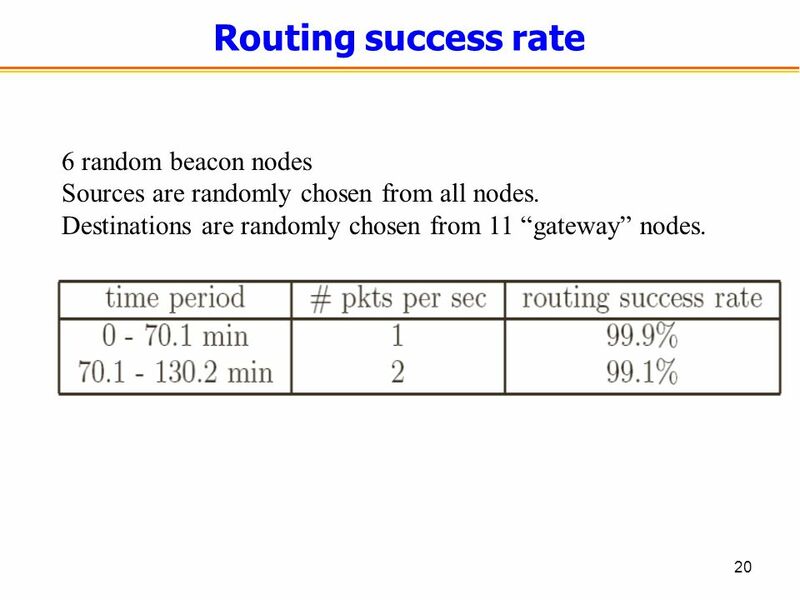 Destinations are randomly chosen from 11 “gateway” nodes. 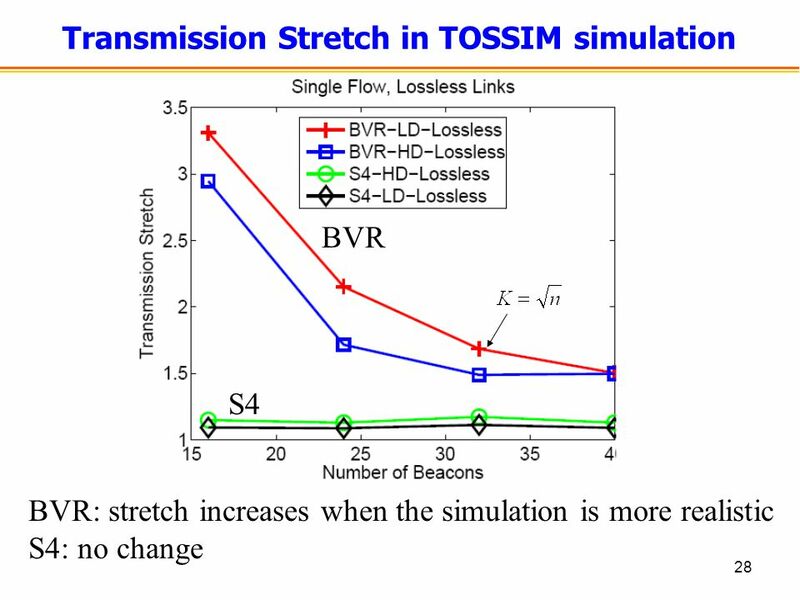 27 27 stretch comparison High-level simulation: 3200 nodes, high density For average cases, S4 has routing and transmission stretches close to optimal, consistently smaller than BVR. 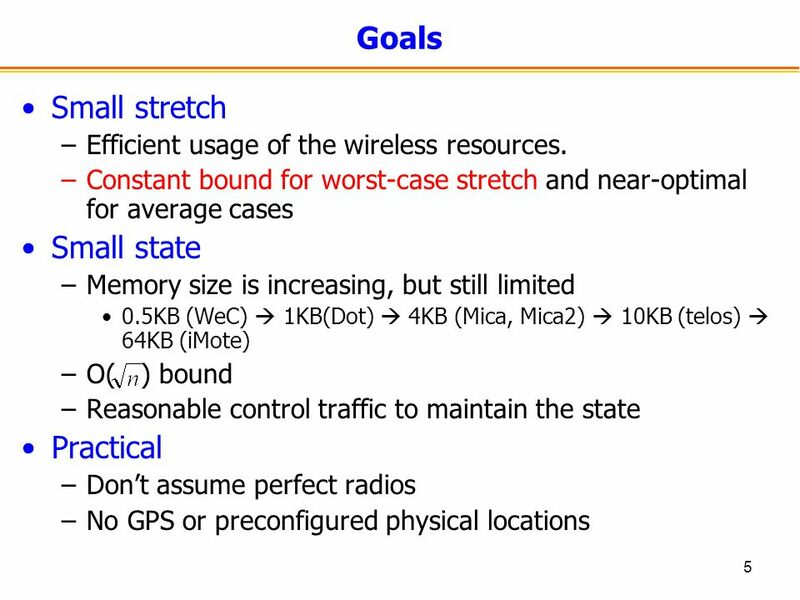 Download ppt "1 S4: Small State and Small Stretch Routing for Large Wireless Sensor Networks Yun Mao 2, Feng Wang 1, Lili Qiu 1, Simon S. Lam 1, Jonathan M. Smith 2." Geographic Routing Without Location Information AP, Sylvia, Ion, Scott and Christos. 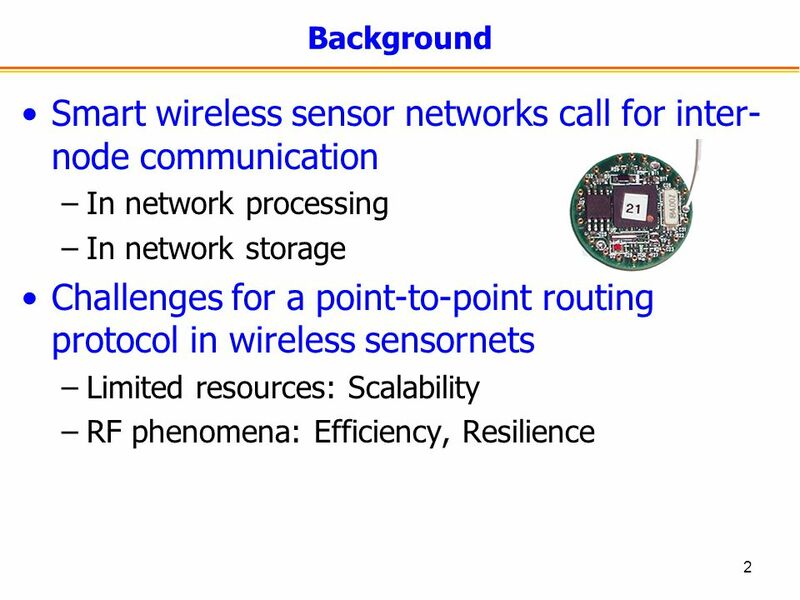 Distributed Assignment of Encoded MAC Addresses in Sensor Networks By Curt Schcurgers Gautam Kulkarni Mani Srivastava Presented By Charuka Silva. 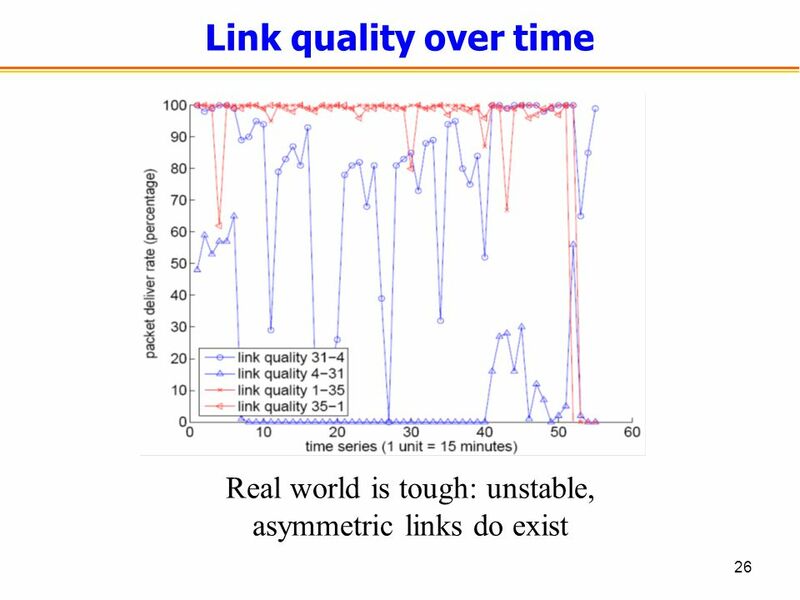 1 Greedy Forwarding in Dynamic Scale-Free Networks Embedded in Hyperbolic Metric Spaces Dmitri Krioukov CAIDA/UCSD Joint work with F. Papadopoulos, M.
1 GPSR: Greedy Perimeter Stateless Routing for Wireless Networks B. Karp, H. T. Kung Borrowed slides from Richard Yang. Trickle: Code Propagation and Maintenance Neil Patel UC Berkeley David Culler UC Berkeley Scott Shenker UC Berkeley ICSI Philip Levis UC Berkeley. 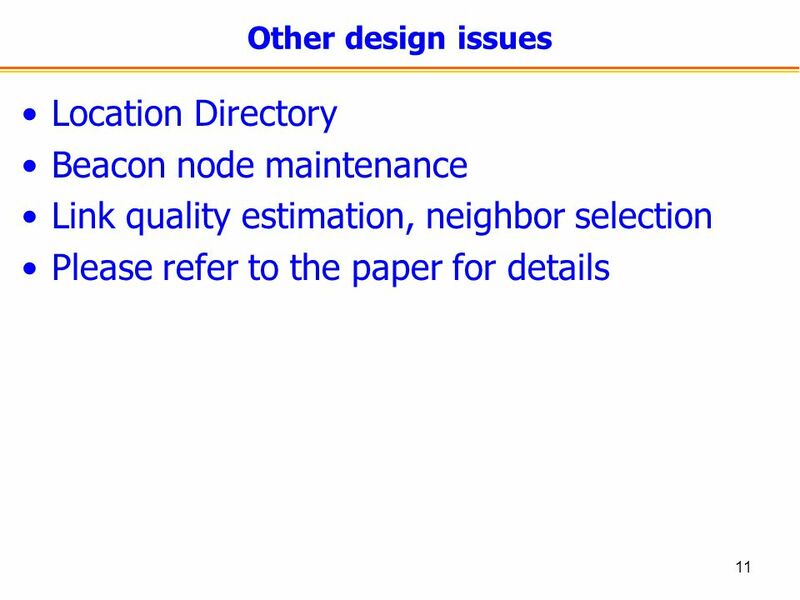 Network Layer Routing Issues (I). Infrastructure vs. multi-hop Infrastructure networks: Infrastructure networks: ◦ One or several Access-Points (AP) connected. 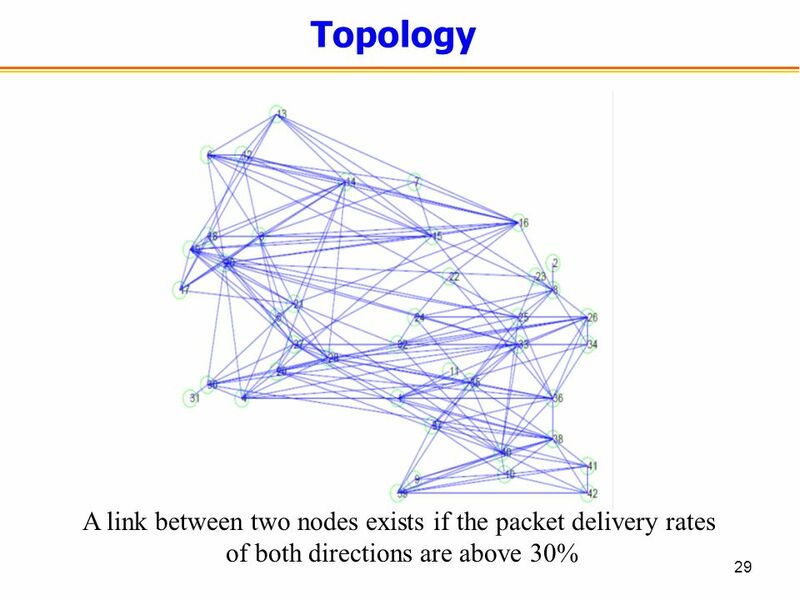 Geographic Routing Without Location Information A. Rao, S. Ratnasamy, C. Papadimitriou, S. Shenker, I. Stoica Paper and Slides by Presented by Ryan Carr. 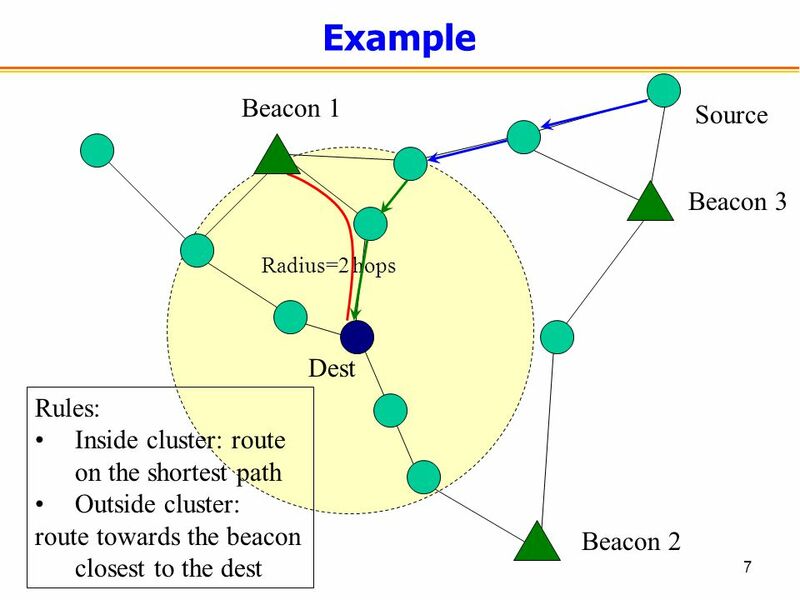 1 Location-Aided Routing (LAR) in Mobile Ad Hoc Networks Young-Bae Ko and Nitin H. Vaidya Yu-Ta Chen 2006 Advanced Wireless Network. 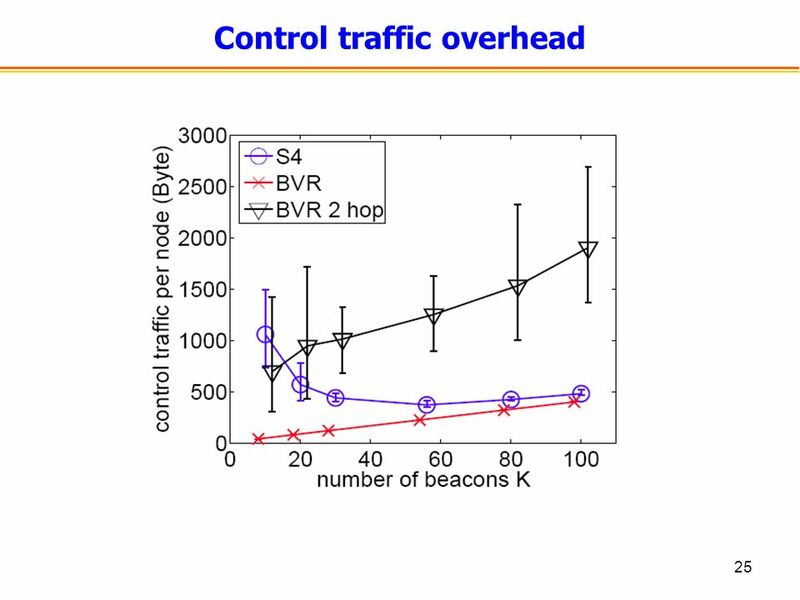 Self-Organizing Hierarchical Routing for Scalable Ad Hoc Networking David B. Johnson Department of Computer Science Rice University Monarch. A Mobile Infrastructure Based VANET Routing Protocol in the Urban Environment School of Electronics Engineering and Computer Science, PKU, Beijing, China. 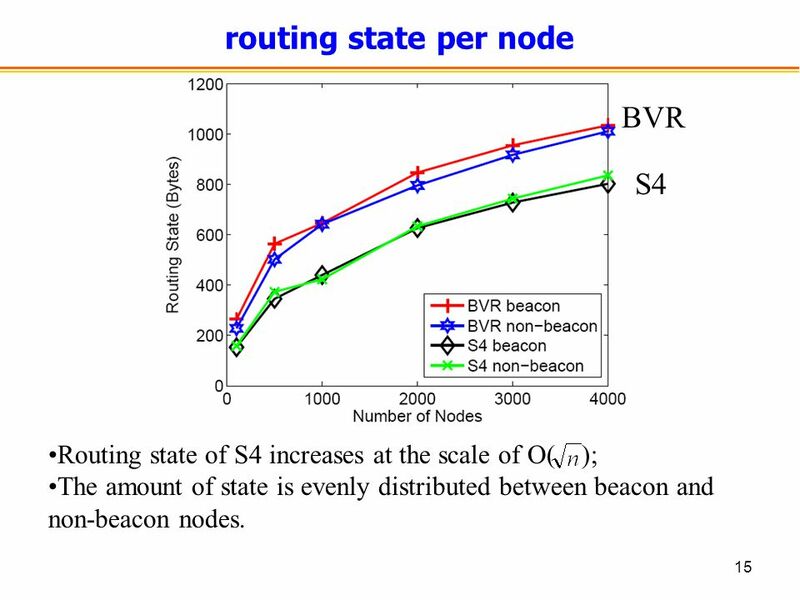 An Analysis of the Optimum Node Density for Ad hoc Mobile Networks Elizabeth M. Royer, P. Michael Melliar-Smith and Louise E. Moser Presented by Aki Happonen. Receiver Based Forwarding for Wireless Sensor Networks Rodrigo Fonseca OASIS Retreat January 2005 Joint work with Ana Sanz Merino, Ion Stoica. 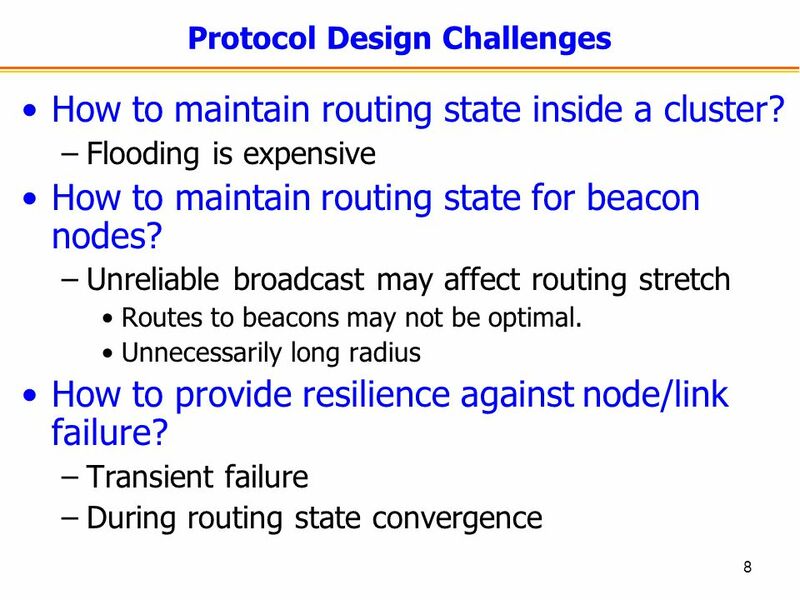 A Remote Code Update Mechanism for Wireless Sensor Networks Thanos Stathopoulos, John Heidemann and Deborah Estrin CEG 790 Presentation By: Trevor Smith.